I’m a big fan of the music and story of Paul Revere and the Raiders. 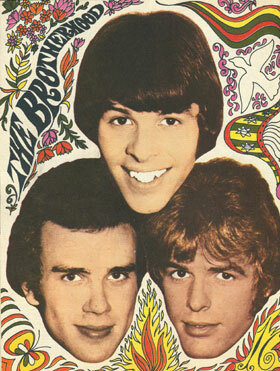 The group was one of the most prominent in 60s pop culture, but they’re somehow forgotten all too often these days. I’ve written extensively on the band over the years. In my research several years back, I discovered that three key band members quit the band at the height of fame. They formed Brotherhood, a group of their own, and quickly descended into obscurity. But what they left behind was a fascinating story, and three albums of good music. Captivated by both that story and the music, I researched, interviewed and wrote the most extensive music-related piece of my career to date. That feature originally ran in Ugly Things Magazine, and was eventually posted online on this blog. The interest generated by my story helped force the eBay value of the group’s three (rare and long out-of-print) albums upward; luckily I had long since scored copies of my own. In early 2012, I interviewed Gordon Anderson of Real Gone Music; he had recently left Collectors Choice Music to start RGM. In the course of our conversations, I lobbied him about the prospect of reissuing the Brotherhood and Friend Sound albums on his label. Licensing matters being what they are, it took some time to secure the rights to the material, but now in February 2014, Brotherhood: The Complete Recordings is finally making its CD debut. An updated version of my Brotherhood story fills the 24-page booklet; the booklet (designed by me, I might add) also includes a raft of photos, many of which are previously unpublished. Bill Kopp: When I got an advance copy of the remasters, I thought it sounded fine. But in hindsight, I realize that in evaluating it, I was using a different measure than you were. To me, “fine” meant that it sounded just like the original RCA vinyl releases. As I now understand it, you viewed this 2014 re-release as an opportunity to get right that which wasn’t quite right back in 1968 and ’69. While we should point out to readers that the mixes weren’t fiddled with on these new reissues – no revisionism here – the new CD releases offer a significant improvement in sound quality over the original versions. Can you speak a bit to the differences in this new remaster? Phil “Fang” Volk: Trying to copy the sound of the original vinyl was never my goal. I’ve never been an avid vinyl aficionado. Back in the day we would work for days on one mix – really trying very, very hard to get it transparent and pristine, with all of the sound registers balanced real nice and feeling warm and full, fat and punchy. And then that would become our quarter-inch master tape, which would be used to press the vinyl records. We would sit back in the studio and listen to that beautiful quarter-inch master tape – that we had just finished – and be so intensely thrilled with the sound quality with all this amazing presence it had. The sound was awesome at that point. So – in 2013, when I requested a second try at the mastering of the Brotherhood albums, my goal was to improve on the inferior sound quality of the old vinyl, and use the latest and greatest technology in today’s recording arts, to bring out the best this music has to offer. Hey, – I would much rather have it enhanced or “tweaked a bit” with the great recording gear that’s available today in this new digital world, and give our music a chance to compete with other digital CDs that are currently on the market. Brotherhood’s music from 1968-69 had to undergo a necessary “sonic re-birth” or metamorphosis to sound as spectacular as today’s artists on CD. It’s only fair! The music, the songs, the arrangements – although frozen in time – still sound great, still sound relevant, still sound timeless – but if the sonic quality can be improved for this new package, I’m all for it…Do it with my blessing!